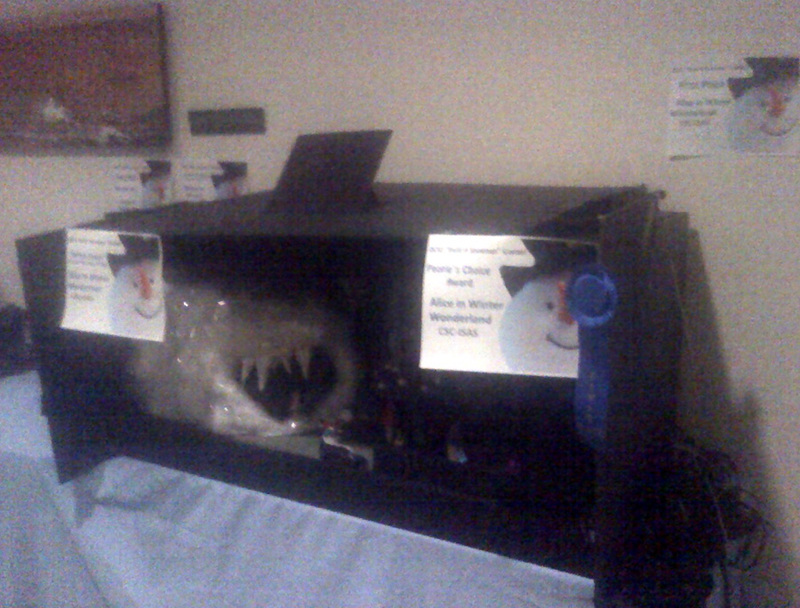 December 2010: I took the competition by storm and won my NASA JPL Section's annual Snowman Contest in a landslide. My former contracting company CSC was thrilled to pieces because it was "their" entry. It was the first time they had won in 8 years. I came up with the idea and created the entire project myself by sketching it out and building it. The Glow Tunnel was constructed with cotton wrapped in clear packing tape. There are two black lights hidden inside and the tunnel goes downward like the beginning of a rabbit hole. The original had moving parts and special effects but it's been dismantled so all I have are 3 still images. 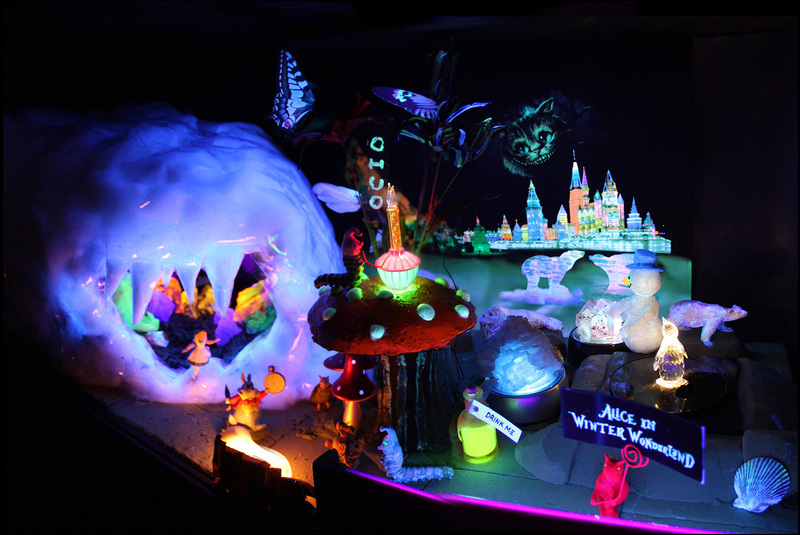 Wide view of "Alice in Winter Wonderland". 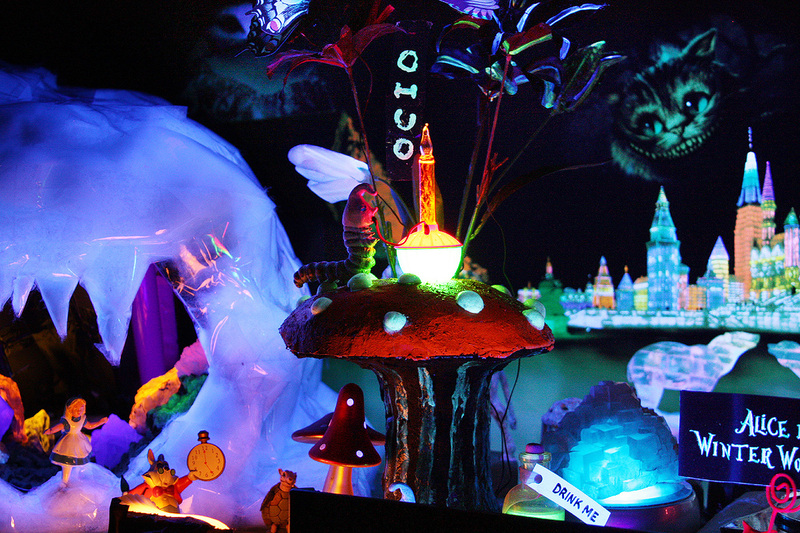 Blacklight poster in background, Alice running out of the Glow Tunnel, filled with fluorescent minerals, the White Rabbit, a Dodo and the Mock Turtle, a hookah-smoking Caterpillar on a custom-made psychedelic mushroom with a built-in "bubble light" simulating the hookah. Overhead two "robotic butterflies" slowly flapped their wings about once every 30 seconds. Each time their wings flapped "invisible" strings would lift up the letters OCIO (my JPL section name). It gave the appearance of the caterpillar blowing "smoke letters" like in the Disney movie. There's a bottle marked "Drink Me" and very importantly a snowman which was supplied by the contest manager. That was the one contest requirement. My sytrofoam snowman is building beautiful ice sculptures. 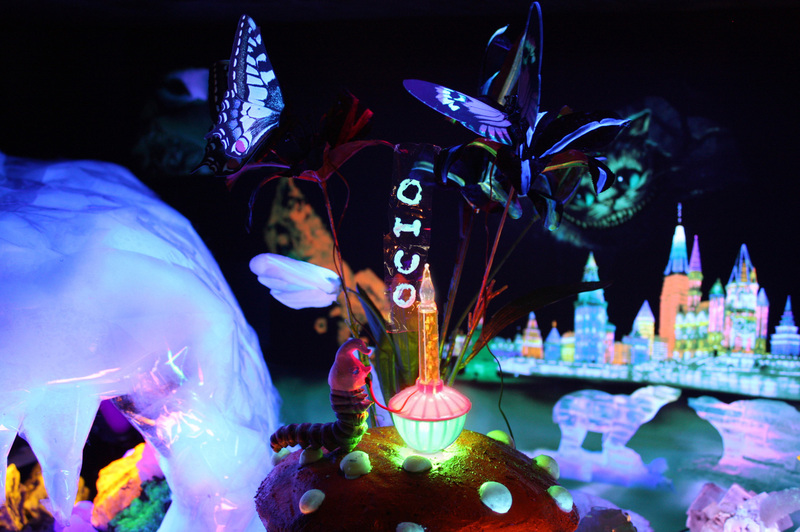 In the background is a custom-made UV ink black light poster. 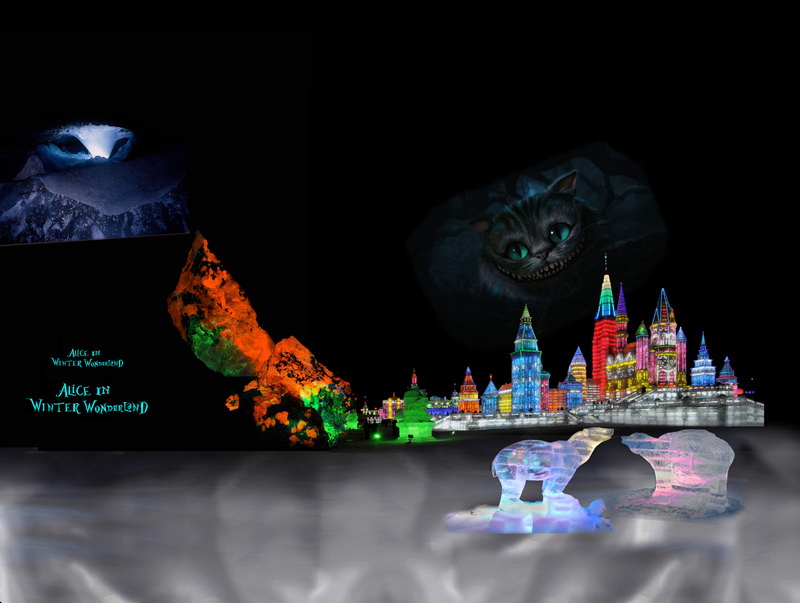 The face of Tim Burton's Cheshire Cat is grinning above a full-size ice sculpture cityscape (taken from ice festival in Harbin, China). There is a Swarovski crystal penguin on a rotating stand with a light underneath which cast amazing psychedelic patterns on the side of the display in a mesmerizing way. 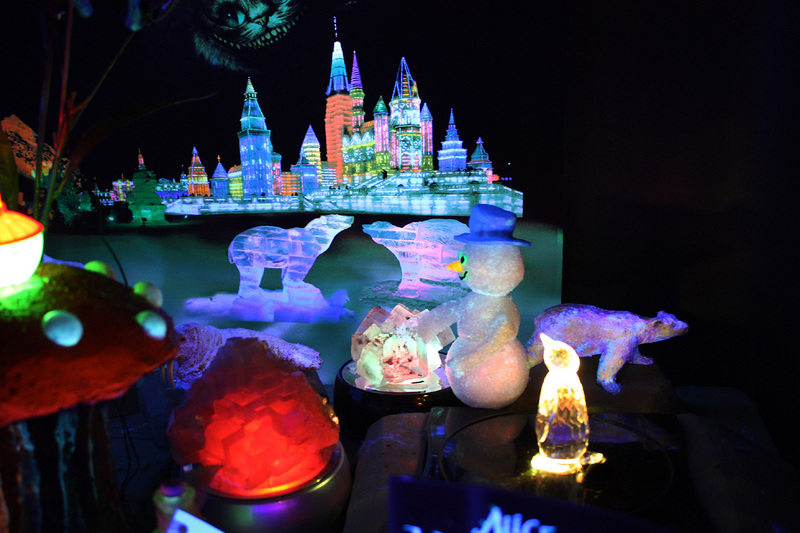 Also in the ice sculpture garden are two rotating colored light-stands topped with ice-like quartz crystal specimens that glowed with different colors as they rotated. They looked like ice sculptures lit from within. There were 2 black light tubes lighting the colorful fluorescent minerals. 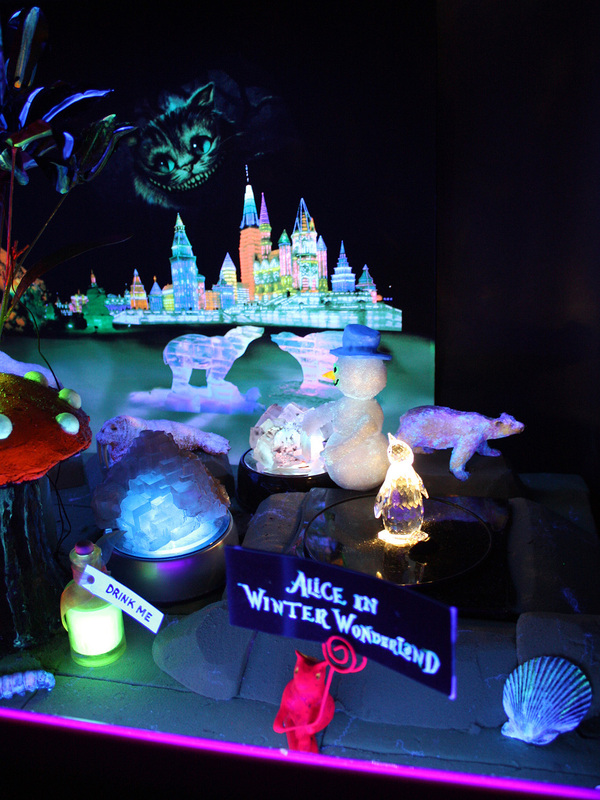 The black lights also made the white cotton-like material I used for the tunnel glow. There is a Swarovski crystal penguin on a rotating stand with a light underneath which cast the amazing psychedelic patterns on the side of the display in a mesmerizing way. Also in the ice sculpture garden are two rotating colored light-stand topped with ice-like quartz crystal specimens that glowed with different colors as they rotated. They looked like ice sculptures lit from within. The hookah-smoking Caterpillar needs no introduction. See previous notes for the complete explanation. Above are two black-painted flowers, with fluorescent paint carefully painted on in an interesting way. I made the Caterpillar from modelling clay. The bubble light hookah was the best part because I had to create it myself. I carved it out of stryo-foam with the cord built inside of it. When the bubble light warmed up it would continuously send bubbles up. The white spots on the Amanita mushroom had "glow paint". Took a long time to get it perfected and I wish I had video of it but I don't. These pics I took are all I have. Lighting was the key to this whole project. I had to find ways to hide many power cords but I did it. There is a Swarovski crystal penguin on a rotating stand with a light underneath which cast amazing psychedelic patterns on the side of the display in a mesmerizing way. Also in the ice sculpture garden are two rotating colored light-stand topped with ice-like quartz crystal specimens that glowed with different colors as they rotated. They looked like ice sculptures lit from within. One of them is green in this pic. There is a Swarovski crystal penguin on a rotating stand with a light underneath which cast amazing psychedelic patterns on the side of the display in a mesmerizing way. Also in the ice sculpture garden are two rotating colored light-stand topped with ice-like quartz crystal specimens that glowed with different colors as they rotated. They looked like ice sculptures lit from within. One of them is blue in this pic. There is a Swarovski crystal penguin on a rotating stand with a light underneath which cast amazing psychedelic patterns on the side of the display in a mesmerizing way. 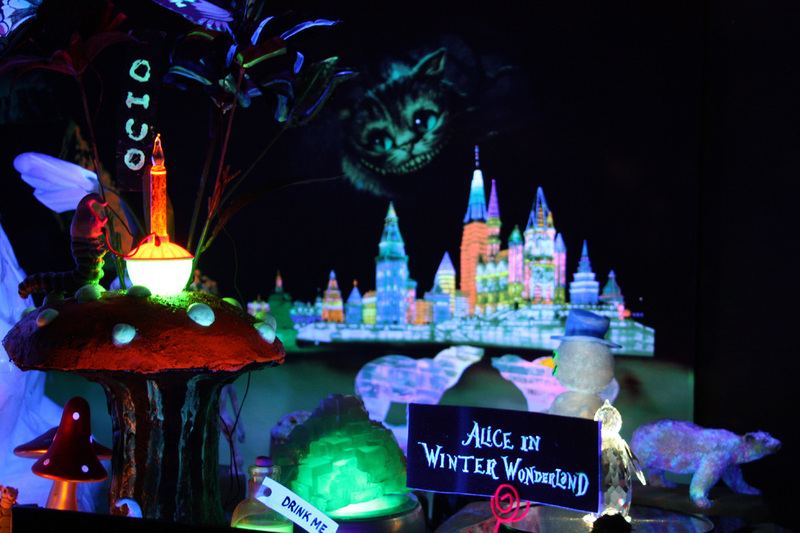 Also in the ice sculpture garden are two rotating colored light-stand topped with ice-like quartz crystal specimens that glowed with different colors as they rotated. They looked like ice sculptures lit from within. One of them is red in this pic. I created this image as a blacklight poster, it glowed in the same colors as you see here because it was printed with special UV-sensitive inks by a company that allowed you to customize posters. Not long after this the company stopped taking small black lite poster orders, unfortunately. 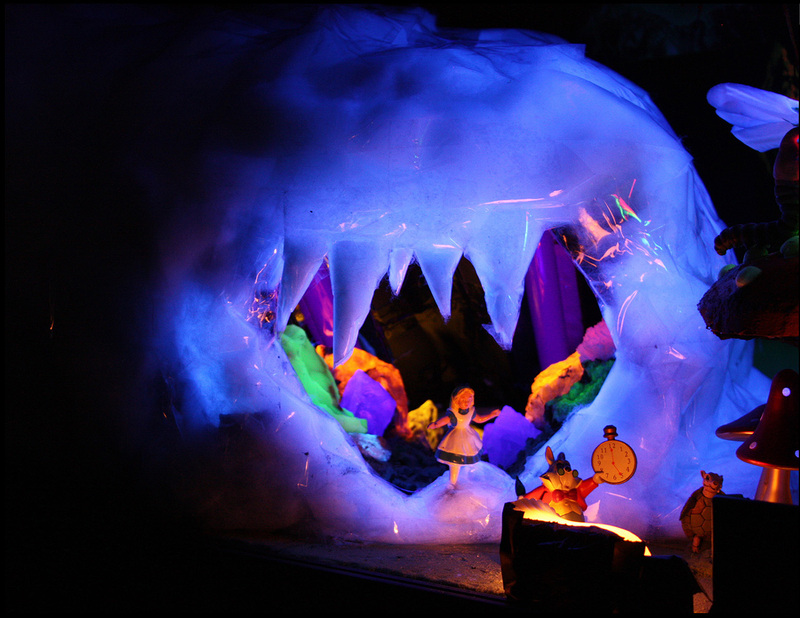 The Cheshire Cat from Tim Burton's Alice In Wonderland is peering over an Ice City in Harbin, China, that was part of Harbin's annual festival. A poor camera shot of the black display case without everything turned on. It won in several categories but the top award was the one I was most happy about. There was a Snowman trophy that my boss kept in his office. This pic was taken with a very old, obsolete cell phone which was all I had at the time.